ABOUT: Dorothy Gale is swept away from a farm in Kansas to a magical land of Oz in a tornado and embarks on a quest with her new friends to see the Wizard who can help her return home to Kansas and help her friends as well. SPECIAL TICKET INFO: No ticket sales available at door. All tickets must be purchased online. DOOR EXTRA INFO: If an event is sold out, we will announce on Facebook and Twitter. TIME: Doors 6:00pm. Live Music 6:30pm. Movie 8:30pm. LIVE MUSIC: Visit www.streetfoodcinema.com/the-wizard-of-oz/ for the most current Live Music listing! 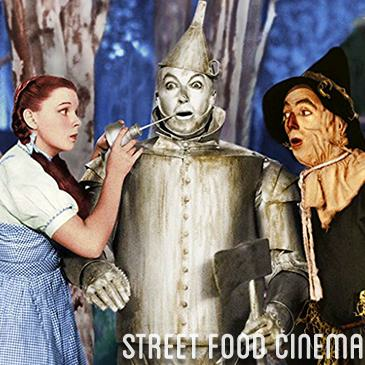 FOOD TRUCKS: Visit www.streetfoodcinema.com/the-wizard-of-oz/ for the most current Food Truck listing! PARKING NOTES: No residential street parking allowed.